The Platinum Series family of microprocessor-based PID controllers offer unparalleled flexibility in process measurement. While extremely powerful and versatile, great care has gone into designing a product that is very easy to set-up and use. The automatic hardware configuration recognition eliminates the need for jumpers and allows the firmware to automatically simplify itself, eliminating all menu options that do not apply to a specific configuration. Offered in 1⁄32, 1⁄16, and 1⁄8 DIN sizes, the 1⁄16 and 1⁄8 DIN models can be configured with dual displays. Each unit allows the user to select the input type from 9 thermocouple types, PRT/RTD sensors, thermistors, DC voltage, DC current, and Strain & Bridge inputs. 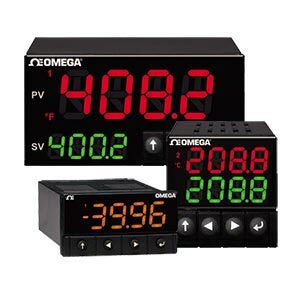 The full bidirectional voltage or current inputs are fully scalable to virtually all engineering units, with a selectable decimal point that is perfect for use with pressure, flow, or other process input. Up to 6 programmable outputs including the isolated analogue and additional features make this the most powerful product in its class. Standard features include: remote set-point for cascaded control, high-high/low-low alarms, external latch reset, external ramp and soak initiation, combination heat/cool control mode and configuration save and transfer. Excitation: Menu selectable (no jumpers to set) 5, 10, 12, and 24 Vdc @ 25 mA (12 V max for DC powered units). 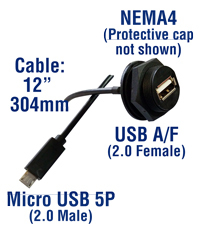 Use the optional PT-USB-CABLE for an IP65 rated panel mount USB connector. A 300 mm length cable connects from USB port of Platinum controller to your control panel. This accessory includes a protective end cap when not in use. Noter: Comes complete with quick-start manual with downloadable operator’s manual. 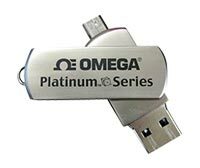 Free Omega Enterprise Gateway software can be downloaded for use with a PC to log data from the unit via any installed communications channel.